Extended base pads of machined aluminum or Delrin® clamp securely to the magazine with an aluminum retainer plate, eliminating unexpected “speed-unloads” when a plastic snap-on extender fails. Designed to keep magazine overall length within the 140mm and 170mm USPSA and IPSC limits. 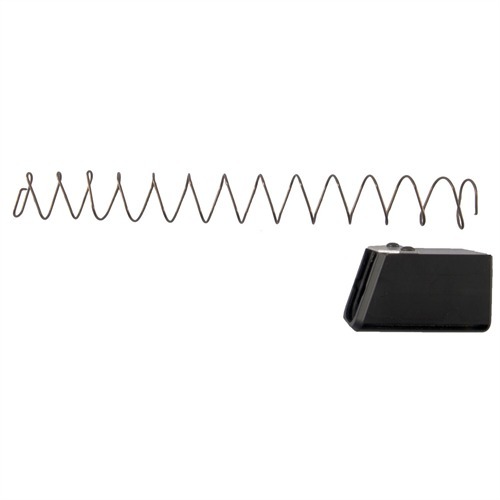 Glock® models include extended magazine spring, and are available in Drop configuration that fits “drop-free” magazines or Non-Drop Pad that fits original, non-drop magazines. Glock® +5 adds 5 rounds of .40, 6 rounds of 9mm. 140mm OAL for USPSA. Glock® +8 adds 8 rounds of .40, 10 rounds of 9mm. 170mm OAL for IPSC International Open class. SPECS: Machined aluminum, hardcoat anodized, or Delrin (Glock® only), black. Aluminum clamp, natural silver. Glock® +5 fits 17/18/19/22/23/24. Glock® +8 fits 17/17L/18/19/22/23/24/24C. Utvidet base pads dreid aluminum eller Delrin ® klemme på bladet med en aluminiumsplate holderen, eliminere uventet "hastighet-laster ut" når en plast hurtigfeste extender mislykkes. Utformet for å holde bladet lengde 140mm og 170mm USPSA og IPSC grenser. Glock ®-modeller inkluderer utvidet magasinet våren, og er tilgjengelig i Drop konfigurasjonen som passer "drop-fri" magasiner eller ikke-slipp Pad som passer opprinnelige, ikke-slipp magasiner. Glock ® 5 legger 5 runder 40, 6 omg av 9 mm. 140 mm OAL for USPSA. Glock ® 8 legger til 8 runder av 40, 10 runder av 9 mm. 170 mm OAL for IPSC International åpen klasse. "GLOCK" er en federally registrert varemerke Glock, Inc. og er en av mange varemerker eid av Glock, Inc. eller Glock Ges.m.b.H. Brownells er en selvstendig forhandler av reservedeler og tilbehør ® for Glock pistoler, og er ikke tilknyttet eller godkjent av Glock, Inc. eller Glock Ges.m.b.H. Bruk av Glock på denne siden er bare annonsere salg av Glock deler eller komponenter. som indikert i produktbeskrivelser, ikke alle deler og tilbehør er offisielle Glock produkter. Spesifikasjoner: maskinert aluminium, hardcoat eloksert eller Delrin (Glock ® bare), svart. Aluminium klemme, naturlig sølv. Glock ® 5 passer 17/18/19/22/23/24. Glock ® 8 passer 17/17 L/18/19/22/23/24/24 C.
I put the long extension on a 22 round Glock .40S&W magazine, can only get 5 extra rounds in mag. Otherwise nice product. 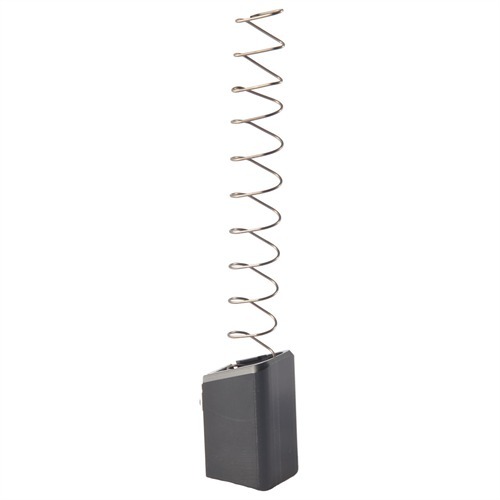 Great product to increase magazine capacity for your Glock. Made for competition shooting. Bought one for my Glock 17 and after contouring the follower, it works flawlessly. Will be buying more of these. I have tried many brands of mag extensions while shooting USPSA and 3 gun matches. I purchased 2 of these for shooting open division with my Glock G17. They are easy to install and I was able to get 27 rounds in one and 28 in another when added to a factory G17 mag. I start a stage with these mags and don't reload them during a stage. The 28 rounder can be harder to seat on a closed slide so would have to download one round for reloads. Many of the local range surfaces can be rocky and we also shoot indoor matches in the winter. Both magazines have broken where it attaches to the G17 mag. Although this is extreme conditions to expect equipment to operate in, I have never had this problem with any other mag extensions. My favorites are the Taran Tacticals however since I am not aware of any other +8s for the Glock I will purchase 2 more. Cannot seem to get the last round in my G22 magazine to make it +5. 20 rounds fit in the mag, but good luck getting that magazine to seat. Loaded with 20, it runs flawlessly when inserted at slide lock. Bought one to test first. Now I'm buying more. Bought four and installed without issue. Were hard to load to capacity at first. No issues after one session at range. No issue seating on closed slide. Functioned flawlessly. Tried the other popular versions but had endless issues. Strongly recommend. I love these things, by far one of my favorite improvements to my Glocks. Yes, it is difficult to load it to capacity but with the Glock loading tool I had no problems. If you are not able to fit all +5 rounds into the mags then you might want to disassemble the mags again and make sure that there are no bur's or edges catching on the spring. I had this issue with one of my mags, and it was quickly remedied with a little smoothing. I have several of these & they work fine. Getting a stock Glock magazine baseplate is the hardest part of the installation. After that, it takes only a few moments to complete. It's well-made & looks OK; and it works. I put these on a M&P 9 without any problems. I and another person put them on our mags for gen 4 Glock 22 pistols and both of us had numerous feeding issues. I haven't tried them in a Gen 3 Glock as of yet to see if that makes a difference yet. Drop Mag Pad +12 170mm for Glock® Utvidet base pads dreid aluminum eller Delrin ® klemme på bladet med en aluminiumsplate holderen, eliminere uventet "hastighet-laster ut" når en plast hurtigfeste extender mislykkes. Utformet for å holde bladet lengde 140mm og 170mm USPSA og IPSC grenser. Glock ®-modeller inkluderer utvidet magasinet våren, og er tilgjengelig i Drop konfigurasjonen som passer "drop-fri" magasiner eller ikke-slipp Pad som passer opprinnelige, ikke-slipp magasiner. Glock ® 5 legger 5 runder 40, 6 omg av 9 mm. 140 mm OAL for USPSA. Glock ® 8 legger til 8 runder av 40, 10 runder av 9 mm. 170 mm OAL for IPSC International åpen klasse. Drop Mag Pad +5 for Glock® Utvidet base pads dreid aluminum eller Delrin ® klemme på bladet med en aluminiumsplate holderen, eliminere uventet "hastighet-laster ut" når en plast hurtigfeste extender mislykkes. Utformet for å holde bladet lengde 140mm og 170mm USPSA og IPSC grenser. Glock ®-modeller inkluderer utvidet magasinet våren, og er tilgjengelig i Drop konfigurasjonen som passer "drop-fri" magasiner eller ikke-slipp Pad som passer opprinnelige, ikke-slipp magasiner. Glock ® 5 legger 5 runder 40, 6 omg av 9 mm. 140 mm OAL for USPSA. Glock ® 8 legger til 8 runder av 40, 10 runder av 9 mm. 170 mm OAL for IPSC International åpen klasse.